How is the NSSC Doing? By Keith Cowing on July 31, 2008 11:50 PM. Reader note: "Question to all NASA managers: How do you feel about the NSSC hiring your best and brightest when they can't even pay your center bills, can't move new employees cross country, can't answer basic retirement questions, and don't return your calls? Question to the NASA Center Directors: How do you feel about not having any control over your hiring? And how do you feel about moving your credible civil service positions to inept contracted positions?" By Keith Cowing on July 31, 2008 10:38 PM. "NASA, in partnership with the Exploratorium Science Center, San Francisco, Calif., and the University of California at Berkeley, will transmit live images of the Aug. 1, 2008, total eclipse of the sun." By Keith Cowing on July 31, 2008 10:00 PM. "One way to recreate those conditions on the ground is for test participants to lie down with head slightly tilted back for 90 days. "It's very relaxing at times. This is probably the most I've sat still in 10 years," participant Heather Archuletta told MyFOXHouston.com." By Keith Cowing on July 31, 2008 4:19 PM. "Laboratory tests aboard NASA's Phoenix Mars Lander have identified water in a soil sample. The lander's robotic arm delivered the sample Wednesday to an instrument that identifies vapors produced by the heating of samples. "We have water," said William Boynton of the University of Arizona, lead scientist for the Thermal and Evolved-Gas Analyzer, or TEGA. "We've seen evidence for this water ice before in observations by the Mars Odyssey orbiter and in disappearing chunks observed by Phoenix last month, but this is the first time Martian water has been touched and tasted." By Keith Cowing on July 31, 2008 8:26 AM. "The White House blueprint, Glenn said, forced NASA to "cannibalize" existing programs such as the shuttle to finance the new direction. Chris Shank, a senior official at NASA, acknowledged in a telephone interview that NASA had not received additional funding to cover the president's blueprint. NASA also had shouldered unforeseen return-to-flight costs after the loss of the shuttle Columbia on re-entry in 2003. Shank declined to discuss the agency's reaction to Glenn's appeal or apparent effort to shape the space agenda for the next administration." By Keith Cowing on July 30, 2008 2:16 PM. "Today, the House Committee on Science and Technology held a hearing to celebrate the National Aeronautics and Space Administration's (NASA) 50th anniversary by reviewing its accomplishments and examining its future opportunities and challenges. Committee Members questioned a distinguished panel of witnesses, including Hon. John Glenn -- the first American to orbit the Earth -- regarding the most influential factors that have shaped our nation's leadership in space and Earth science, aeronautics, and human spaceflight and exploration." By Keith Cowing on July 30, 2008 2:02 PM. "Mars Express closed in on the intriguing martian moon Phobos at 6:49 CEST on 23 July, flying past at 3 km/s, only 93 km from the moon. The ESA spacecraft's fly-bys of the moon have returned its most detailed full-disc images ever, also in 3-D, using the High Resolution Stereo Camera on board." By Keith Cowing on July 30, 2008 2:00 PM. "Scientists have confirmed that at least one body in our solar system, other than Earth, has a surface liquid lake. Using an instrument on NASA's Cassini orbiter, they discovered that a lake-like feature in the south polar region of Saturn's moon, Titan, is truly wet. The lake is about 235 kilometers, or 150 miles, long." By Keith Cowing on July 30, 2008 11:14 AM. "In recent years, Washington has failed to give NASA a robust, balanced and adequately funded mission. Though the good people of NASA who work day in and day out on new frontiers are doing amazing things, Americans are no longer inspired as they once were. That's a failure of leadership. "I believe we need to revitalize NASA's mission to maintain America's leadership, and recommit our nation to the space program, and as President I intend to do just that. We must revive the American ingenuity that led millions of children look to NASA astronauts and scientists as role models and enter the fields of math, engineering and science. Our leadership in the world depends on it." "While my opponent seems content to retreat from American exploration of space for a decade, I am not. As President, I will act to ensure our astronauts will continue to explore space, and not just by hitching a ride with someone else. I intend to make sure that the NASA Constellation program ha s the resources it needs so that we can begin a new era of human space exploration. A country that sent a man to the moon should expect no less." By Keith Cowing on July 30, 2008 11:05 AM. "NASA hosted a meeting of space agencies from nine countries last week to discuss the next steps in the ongoing scientific exploration of the moon. The meeting laid the groundwork for a new generation of lunar science. Discussions, led by NASA Headquarters officials, were held at NASA's Lunar Science Institute, located at the Ames Research Center at Moffett Field, Calif."
Editor's note: This meeting was held last week. Why did SMD PAO wait so long (last night) to tell people about this? There were domestic and foreign news stories out at the end of last week - its not like this was a secret. "The U.S. and eight other nations signed a landmark agreement at NASA's Ames Research Center in Mountain View this week that scientists hope will lay the groundwork for a new generation of lunar exploration." By Keith Cowing on July 29, 2008 4:13 PM. By Keith Cowing on July 29, 2008 12:28 PM. Editor's update: I finally got a call from Beth Dickey at Aeronautics PAO - after I complained to PAO about zero response from her. I then had to push three times before she began to tell me why I was not invited to the 11 July Aeronautics media event. Why I never got the audio recording of that event is an even sillier story. This is a typical case of lack of coordination, planning, or concern for getting information to those of us who want to get it in front of a wider audience. NASA HQ Aeronautics PAO is inept as far as I am concerned. It is also uncalled for given the excellence that can be clearly seen in other PAO activities at HQ and across the agency. Continue reading Dropping the Ball at NASA Aeronautics PAO (Update). By Keith Cowing on July 28, 2008 10:37 PM. "Fiscal Year 2009 begins two months from this Friday. Yet appropriations work on Capitol Hill has become seriously bogged down, and it now appears that it may not be until March 2009 - about six months into the new fiscal year - when the FY 2009 appropriations' cycle will be finished. ... There are additional factors leading to this impasse. The potential for confrontations and delay during floor consideration is high in areas ranging from policy to funding levels to earmarks. The Democratic leadership contends that President Bush would veto any appropriations bill sent to him, which based on last year's experience seems likely." By Keith Cowing on July 28, 2008 6:16 PM. "Obama has said that his education proposals would cost about $18 billion and would be funded by trimming NASA's budget and auctioning surplus federal properties, among other measures. But most of the Illinois senator's education proposals are so costly that they would require Congress to approve additional new spending. He says he wants to make "a historic commitment" to education, because he wants to give every American child the same chances he had." "Fiscal realities and NASA's commitment to keeping its $17-billion budget flat already seem to be putting a limit on Constellation, but Bush's, and now McCain's, vision nicely balances realism and ambition. Yet it's Obama who is sounding like the more realistic, market-oriented candidate. His campaign said recently that Obama hopes to enhance NASA's role "in confronting the challenges we face here on Earth, including global climate change" and "to reach out and include international partners and engage the private sector to increase NASA's reach and provide real public economic benefits for the nation." By Keith Cowing on July 28, 2008 1:00 PM. "On the subject of women in the sciences, Ride said, "the number of women are still lagging behind the number of men, particularly in physics, which is my field, and engineering." Ride noted that statistics indicate elementary school students are very interested in science, but female students somewhat less so. Explaining the importance of these figures, Ride said, "In fourth grade fully two-thirds of our kids still like science, the schools haven't beaten it out of them yet." She continued, "starting at about fifth grade, sixth grade, seventh grade, we start to loose both the boys and the girls, but we loose girls at greater numbers than boys." Ride suggested that the reason girls lose interest in science is because of the messages society sends to girls that they internalize and feel discouraged by." By Keith Cowing on July 28, 2008 11:26 AM. "It might have been better for NASA's reputation if it, too, had closed down at that point, but bureaucracies never do. Like people, their idealistic and enthusiastic youths are eventually overwhelmed by quotidian reality, and they do what they need to to survive. And survive NASA has, through a space-shuttle programme far more expensive than the "throw-away" rockets it was supposed to replace, through the construction of an orbiting space station that will have consumed $100 billion when it is finished, though it has produced little of scientific value--and also, it must be said, through a programme of unmanned scientific space probes that have, literally, pushed back the frontiers of human understanding." By Keith Cowing on July 28, 2008 11:15 AM. "You may not always agree with what NASA does in its role as the national space agency for the United States. I dont always agree with them. However, I do think they (this group of people under the name National Aeronautics and Space Administration) are trying their best to advance human and robotic space exploration for the benefit of the United States, and for the whole of humanity, too." "You all know today that this first Shuttle mission to service the Hubble, as well as the three which followed, were huge successes. The Hubble dazzles us with the splendor of our universe, but during those grim years between 1990 and '93, its awe-inspiring success was far from certain. If you didn't know the core strength of the NASA team when the chips are down, you might have bet against us. You would have lost." By Keith Cowing on July 28, 2008 11:10 AM. "It is more than a matter of pride. Griffin likens the space station to a miniature Antarctic research base, which needs a regular supply of food and water, which suffers technical glitches, and needs to have its staff rotated on a regular basis for their sanity if nothing else. Both the US and Russian space agencies agree that at a minimum, it needs two independent supply chains - read rockets - to ensure the safety of the station and those on board. Nasa's push for the moon and Mars will leave just one. "Anyone who doesn't understand why that is a problem, from my perspective, just hasn't done enough real things in their life." Editor's note: I agree Mike. So why is NASA creating the gap in the first place? Why has the gap grown during your tenure? By Keith Cowing on July 28, 2008 10:43 AM. By Keith Cowing on July 27, 2008 4:58 PM. "Edgar Mitchell, the sixth man to walk on the moon, says aliens been visiting the earth for the past sixty years. A veteran of the Apollo 14 mission, Mitchell also says world governments are aware of the alien visits, but have covered them up." Editor's note: This story has been on Drudge Report for several days. The link to this story and video has been at the top of the page all day. By Keith Cowing on July 27, 2008 4:56 PM. "Newly released recordings from a May police chase that ended in a fatal crash on Redstone Arsenal show Huntsville police pursued the fleeing car for more than 8 minutes and 11 miles, prompting some experts to ask whether the chase should have been aborted sooner. The police recordings, requested by The Times, chronicle the chase of 35-year-old Valorie Keil Cox, who fled police after an alleged drug deal." Starfleet Academy In The Making? By Keith Cowing on July 26, 2008 1:43 AM. "Well, not really. But in terms of performing some functions that used to be the exclusive domain of NASA and some major aerospace contractors, they may indeed be filling a significant void. That's the gist of a story a few days ago on Space Review, called "Student satellites: encouraging trend or a sign of panic?" By Keith Cowing on July 26, 2008 12:13 AM. "Launch of NASA's Lunar Reconnaissance Orbiter (LRO), the first robotic precursor mission under President Bush's plan for moving human space exploration beyond Earth orbit, will be delayed until after Bush leaves office. Also delayed until late February or early March 2009 is the Lunar Crater Observation and Sensing Satellite (LCROSS), a piggyback payload added by Ames Research Center when LRO was upgraded to an Atlas V-class mission." By Keith Cowing on July 25, 2008 11:40 PM. "Phil Mickelson, the No. 2-ranked golfer in the world, came to the capital to tell Congress that America is in trouble; its schools aren't producing enough math and science graduates to keep up with the world. The National Science Foundation estimates that 80% of the jobs in the next decade will require some form of math and science skills. "Everybody knows Phil as a golfer," Amy said. "But I think there's an astronaut trapped inside his body." Mickelson loves to talk about space exploration, but he stuck to golf to emphasize to a group of students, all members of local First Tee Chapters, how math and science is used in life." By Keith Cowing on July 25, 2008 6:24 PM. "Tickets go on sale Monday, July 28, for the NASA 50th Anniversary JSC Golden Celebration. This event celebrates you and your dedicated service to the space program. ... Every JSC team member, civil servant and contractor, is invited to attend the JSC Golden Celebration along with their family and friends. This is not a public event. This is a celebration for you." By Keith Cowing on July 25, 2008 2:13 PM. "The six crew members were identified as .... Col. George Martin, flight surgeon, who was also the deputy commander of 36th Medical Group at Andersen." Photo, "Ursula Martin, wife of Col. George Martin, thanks the myriad of agencies Friday in for their search for the Airmen who lost their lives in Monday's B-52 crash." Editor's note: I knew George from my first stay on Devon island in 2002 when he served as our camp doctor for several weeks. I got to know him well during his stint there - especially given the fact that I was a research volunteer and he was constantly jabbing my arm to draw blood. George was a really, really nice guy. Just pleasant to be around. George really wanted to be an astronaut and was working every angle he could to get proficient in a wide variety of skills - and experiences. As I understand the situation he jumped on the plane at the last minute for the fun of it. That was George all right. "George, 51, was the deputy commander of 36th Medical Group at Andersen Air Force Base on Guam. His love for space extended to his family as he named his daughter Gemini, and his dogs were named Apollo and Mercury. For those of us who had the privilege of working with George when he was at the HMP and came to know him, if only briefly, we will miss him." By Keith Cowing on July 25, 2008 11:41 AM. "NASA documents obtained by the Orlando Sentinel suggest that it will be years before the agency will know whether its proposed fixes will work. In the meantime, the documents say, new problems have arisen involving the design of Ares launch pad, the astronaut emergency escape system on Orion and the capsule's heat protection system. A NASA report made public last week said the agency will probably not meet its own internal goal of launching the rocket in 2013, and may even miss its publicly stated goal of a launch by 2015. However, NASA officials publicly insist the 2015 date is still on track." By Keith Cowing on July 25, 2008 11:33 AM. "Astronaut Garrett Reisman tells Stephen he wrote the secret codes to the self-destruct mechanism on his WristStrong bracelet." Continue reading Today's Video: Garrett Reisman Does Colbert Report. By Keith Cowing on July 25, 2008 12:17 AM. "Marshall Center Director David King will hold an all-hands meeting with Marshall team members at 9 a.m. Friday, July 25, in Building 4316, the Activities Building. The subject of the meeting is the May 30 events on Redstone Arsenal that resulted in the death of a Marshall employee. King will begin with opening comments and the introduction of guests Maj. Gen. Jim Myles, Commanding General, U.S. Army Aviation and Missile Command, Redstone Arsenal; Col. John Olshefski, Redstone Arsenal Garrison Commander; and Keith Ryan, Intelligence and Security director for Redstone Arsenal." By Keith Cowing on July 24, 2008 1:40 PM. Editor's note: There is a curious ad in the latest issue of Marshall Star, pg.5: "Free: Tabby kittens, no snake owners." By Keith Cowing on July 24, 2008 10:24 AM. "Former NASA astronaut and moon-walker Dr Edgar Mitchell - a veteran of the Apollo 14 mission - has stunningly claimed aliens exist. And he says extra-terrestrials have visited Earth on several occasions - but the alien contact has been repeatedly covered up by governments for six decades." Editor's note: I assume you have proof to back up your extraterrestrial conspiracy mongering, Ed. By Keith Cowing on July 23, 2008 6:03 PM. "It is designed to replace the Soyuz vehicle currently in use by Russia and will allow Europe to participate directly in crew transportation. The reusable ship was conceived to carry four people towards the Moon, rivalling the US Ares/Orion system. Unlike previous crewed vehicles, it will use thrusters to make a soft landing when it returns to Earth." Editor's note: Soyuz vehicles have been using braking rockets for decades. By Keith Cowing on July 23, 2008 2:26 PM. "U.S. Rep. John Culberson of Houston apologized Tuesday night for condemning NASA last week as a failure and a waste of federal money. "Every agency wastes money but NASA itself is not a waste," the Republican lawmaker said during a video conference with constituents. "These fine people, the scientists and engineers there at NASA, I certainly owe these folks an apology because that is not what I meant to say." "There's a lot of wonderful people working there," said Culberson, "but NASA wastes a vast amount of money." Editor's note: Gee, Culbertson was so resolute in his stance just a week ago. There was little doubt what he "meant". What caused him to back track and change his mind? Did he not mean what he said before? Does he mean what he says now? How can we tell? By Keith Cowing on July 22, 2008 12:06 PM. Rob Ferl - Plants in Lunar Exploration. Not your grandfather's garden we are talking about here. Plants complete the habitation environment in space - life support, food etc. Use of small plants - Arabidopsis - as reporter plants to understand adaptation to environments such as space. Larry Young - NASA Bioastronautics Roadmap 1997-2005 identified 55 risks and risk factors and 250 enabling resources needed for long term human exploration. We are going to the Moon as a stepping stone to Mars - we should therefore learn as much as we can along the way - while doing science that can only be done on the Moon. Issues - bone and muscle loss, response to fractional gravity, space radiation, lunar dust. Need to consier all of these issues before human go to the moon. I am heartbroken that the Centrifuge Accommodation Module is not flying on the ISS where we can look at the region between zero and 1 G but the moon, at least, gives us a shot at looking at 1/6th G.
John Charles NASA JSC - Stay times on the moon during Apollo provided valuable but limited data. Working on plans for longer term stays on the lunar surface in connection with commensurate stays on the ISS. The Science included in the CAN (Cooperative Agreement Notice) is broad. It includes humans, plants, sustainability. This is how issues on Earth, Moon, and Mars can be tied together - sustainability. By Keith Cowing on July 22, 2008 9:47 AM. "That squirmy disruptive kid who we're putting on Ritalin today might be tomorrow's Neil Armstrong. At least, that is, if we don't overmedicate or "feminize" him to the point that he can't get the education and experience he needs to be a space explorer. ... It certainly seems empirically obvious that most people have little interest in exploring." Editor's note: The author of this article makes some odd, borderline misogynist, and mostly unsupportable claims (mixed with some valid points) as he rambles along trying to explain why people do or not explore. "Empirically obvious"? - Where's the data to support this? By Keith Cowing on July 22, 2008 9:20 AM. "For the next three days, Silicon Valley will be the base for planning humankind's return to the moon, as more than 400 scientists from around the world assemble at NASA/Ames Research Center for a conference on what type of science should be done when astronauts revisit Earth's nearest neighbor." "At the lunar science conference Thursday, NASA scientists will join scientists from Canada, Korea, Japan, Italy and Britain to create an International Lunar Network to help them work together on major projects, said David Morrison, director of the new NASA Lunar Science Institute at Ames. He was joined by Stephen Mackwell, director of the independent Lunar and Planetary Institute in Houston, whose $7 million budget is financed by NASA grants." By Keith Cowing on July 22, 2008 12:17 AM. "Three times a week, in a plain red-brick building near the Pentagon City mall in Arlington, a machine keeps me alive. ... Between the time spent on dialysis and other hours devoted to related testing, I reckon I've lost about a third of my life. My focus, though, is on the 65 percent that's left." Editor's note: The author of this article, Frank Sietzen, co-authored the book "New Moon Rising" with me back in 2004 and is the author of the forthcoming book "The Astronaut and the Fireman". By Keith Cowing on July 21, 2008 5:00 PM. Editor's Note: I was going to try and live blog and make Twitter posts from this conference but the free WiFi never works and the building where the meeting is held seems to block commercial EVDO signals. I might try again tomorrow. Andy Chaikin: Talking about larger social ramifications of Apollo program. The effect that live TV had on the people of Earth. The moon is a wtiness to the early history of the solar system and it is right in our own back yard. Impact events may well have affected the origin and evolution of life on Earth. The moon was revealed by exploration to be a place of spectacular beauty. It is the ony world in the solar system where we can stand and look back at our own place in the solar system. When we do go back I want us to remember what we got the first time and that when we look back at our world we see it for what it is. The moon, as a magnet for exploration, has shown us what we can become. Continue reading Lunar Science Conference Notes. By Keith Cowing on July 21, 2008 12:48 PM. "This could be the Indian summer of Mars exploration. The success of NASA's Phoenix lander has capped a decade of robotic derring-do and discoveries by uncovering chips of ice on the barren surface of the Red Planet's north pole. The find proves the existence of water, a key ingredient of life." By Keith Cowing on July 20, 2008 4:12 PM. "The world's first astronomical observatory bound for the Moon was announced today as a joint venture between the International Lunar Observatory Association (ILOA) and Google Lunar X PRIZE contender Odyssey Moon Limited. A dual function ILO precursor instrument demonstrating observation and communication techniques will be part of the scientific and commercial payloads aboard Odyssey Moon's inaugural "MoonOne" lander mission, planned for 2011, and destined for the lunar equator in pursuit of the Google Lunar X PRIZE." By Keith Cowing on July 19, 2008 10:34 PM. "A friendship of a lifetime began through static. Doug Wheelock loved the Yankees and listened to every game while growing up in the 1960s in Windsor, N.Y., a small town upstate. He would sneak a radio into bed for late games, his mother saying, "That radio better not be on!" By Keith Cowing on July 19, 2008 8:08 PM. "Elements to be included in the Configuration: ... Centrifuge Accommodations Module ... Science Power Module"
Editor's note: I do not see these large, expensive ISS components listed on the Consolidated Launch Manifest for the ISS. Why include things on these models that have been cancelled and will never be placed on the ISS? Why do so for models that you are ordering that serve represent the "Assembly Complete Configuration as identified July, 2008, including changes identified at that time"- a configuration where the "Assembly Complete Configuration" is determined by the publicly issued final manifest for station assembly missions? By Keith Cowing on July 18, 2008 11:39 PM. "I recently learned that NASA has made some limited use of human cadavers in testing during the development of the Orion spacecraft. Now, on first blush, this might sound somewhat macabre. In fact, it is more common than you might expect. There is also a practical reason for using this approach. Let me start by providing the statement that the NASA Public Affairs Office provided me with today in response to an inquiry I made regarding the use of human cadavers in the Orion program: ..."
"Personnel working under contract for NASA used cadavers in tests to develop landing systems, spacesuits and seats in the new Orion moonship, space agency officials said Friday. Three human bodies were used in the tests at Ohio State University Medical Center last summer and fall." "Yesterday it was wee, well today the testing phase for the Orion spacecraft, that will take the place of the space shuttle, has taken a more sinister turn." By Keith Cowing on July 18, 2008 12:04 AM. "NASA's Deep Impact spacecraft has created a video of the moon transiting (passing in front of) Earth as seen from the spacecraft's point of view 31 million miles away. Scientists are using the video to develop techniques to study alien worlds. "Making a video of Earth from so far away helps the search for other life-bearing planets in the Universe by giving insights into how a distant, Earth-like alien world would appear to us," said University of Maryland astronomer Michael A'Hearn, principal investigator for the Deep Impact extended mission, called EPOXI." Continue reading Today's Video: Earth As Alien World. By Keith Cowing on July 17, 2008 10:00 PM. "Two days after telling an online town hall meeting that NASA had "failed us miserably" and "wastes a vast amount of money," Houston Rep. John Culberson said Thursday he was weighing legislation to overhaul the structure of the space agency responsible for about 20,000 Houston-area jobs. Culberson, a blunt-spoken conservative from a heavily Republican westside district, said his proposal would slash NASA headquarter's bureaucracy and enable scientists and engineers to rekindle visionary space exploration." By Keith Cowing on July 17, 2008 6:25 PM. "NASA Administrator Michael Griffin on Thursday announced that Rob Strain will be the next center director of NASA's Goddard Space Flight Center in Greenbelt, Md. Strain is currently the head of the Space Department at the Johns Hopkins University Applied Physics Lab in Laurel, Md. He will assume his duties as center director on Aug. 4." By Keith Cowing on July 17, 2008 3:05 PM. "The heads of the International Space Station (ISS) agencies from Canada, Europe, Japan, Russia and the United States met at European Space Agency (ESA) Headquarters in Paris on July 17, 2008, to review ISS cooperation. As part of their discussions, they noted the significantly expanded capability that the ISS now provides for on-orbit research and technology development activities and as an engineering test bed for flight systems and operations that are critical to future space exploration initiatives. These activities improve the quality of life on Earth by expanding the frontiers of human knowledge." By Keith Cowing on July 17, 2008 1:25 PM. "In the toilets at the Science Operations Center, there are bags containing vials and plastic jugs. A sign above the bags warns: "Do not throw these away!" It is part of an experiment within an experiment. Phoenix scientists are going to sample Mars' ice; Walter Sipes is going to sample the Phoenix scientists' urine -- as a way of assessing their body clocks." By Keith Cowing on July 17, 2008 12:01 AM. "In January 2008, NASA and ESA agreed to conduct a comparative architecture assessment to determine if their respective lunar architecture concepts could complement, augment, or enhance the exploration plans of the other. From January through March representatives from NASA and ESA engaged in a series of joint, qualitative assessments of potential ESA capabilities as applied to NASA's architecture concepts. Initial findings from these assessments, with respect to each potential ESA category under study, are as follows:"
By Keith Cowing on July 17, 2008 12:00 AM. Continue reading Video and Live Webcams from Devon Island. "ICD (International Classification of Diseases) codes are the basic international health codes that exist for just about everything (as this spaceship thing suggests). They're used both for billing purposes and for tracking trends in public health." By Keith Cowing on July 16, 2008 11:04 PM. "Mars once hosted vast lakes, flowing rivers and a variety of other wet environments that had the potential to support life, according to two new studies based on data from the Compact Reconnaissance Imaging Spectrometer for Mars (CRISM) and other instruments on board NASA's Mars Reconnaissance Orbiter (MRO). One study, published in the July 17 issue of Nature, shows that vast regions of the ancient highlands of Mars--which cover about half the planet--contain clay minerals, which can form only in the presence of water." By Keith Cowing on July 16, 2008 9:51 PM. "The two Russian crewmembers of International Space Station (ISS) Expedition 17 have installed a docking target and made other preparations for the arrival of a new pressurized module next summer in the second spacewalk of their mission." By Keith Cowing on July 16, 2008 2:54 PM. "Right now, by popular demand, I thought I'd tell a story about what happened to me when I was a brand new shuttle Flight Director. It sorta ties into some of last week's blog and I promise it won't be pithy or pontificate . . . It was a DoD flight, we still can't talk about the payload or what we accomplished, but it was my first flight and it was a high inclination flight when most of the early shuttle flights had been low inclination. High inclination means the orbit goes further north and south than usual, "inclination" being the technical term for the angle at which the orbit crosses the equator which is equivalent to the highest latitude (north or south) that the orbit reaches." By Keith Cowing on July 16, 2008 12:40 PM. "The 117-page report, posted Wednesday at nasawatch.com, shows an $80 million cost overrun this year for just one motor and a dozen different technical problems that the space agency put in the top risk zone, meaning the problems are considered severe. The report put the program's financial performance in that category. Technical problems included software that may not be developed on time, the heat shield, a dangerous level of shaking during launch, and a hard-to-open hatch door. The report also said NASA's plans would shortchange astronauts' daily water needs, giving them only two liters a day when medical experts say they need at least 2.5 liters." By Keith Cowing on July 16, 2008 12:17 AM. 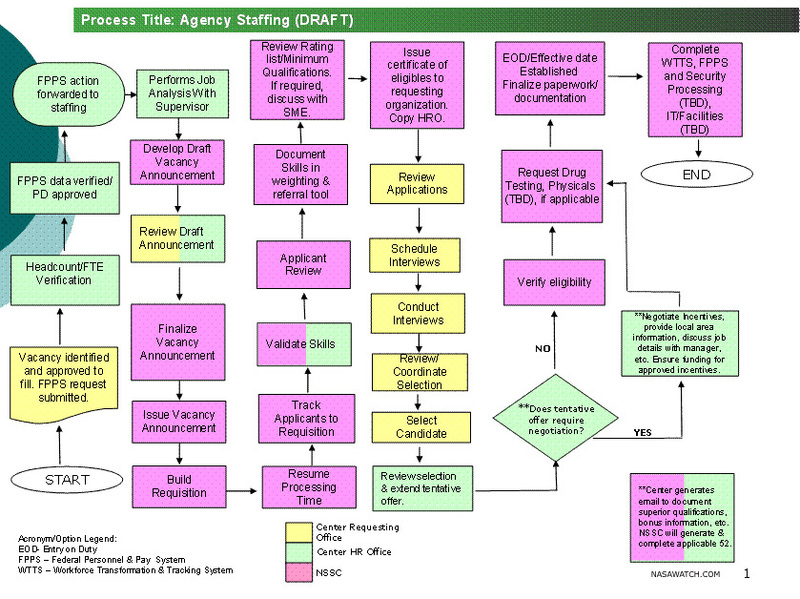 "On 16 January 2008, Constellation Program Manager Jeff Hanley issued an internal agency memo wherein he asked a lot of people to adopt a series of Ares and Orion launch date slips. Most significantly, he said that Ares 1-Y would shifted 12 months from September 2012 to September 2013. All of this arm waving and denials aside, it would seem that Jeff Hanley knew what was going to happen - eventually. NASA sent Lockheed Martin a letter on 1 July 2008 asking that the company "develop a NTE value" for the several changes. One change was to ..."
By Keith Cowing on July 15, 2008 9:23 PM. "An estimated ten million rocky asteroids and ice-and-dirt comets pirouette in outer space, and once in a while their paths fatefully intersect our planet's. One such encounter took place a hundred miles from present-day Washington, D.C., where a 53-mile-wide crater lies buried beneath Chesapeake Bay--the scar left when a two-mile-wide rock smashed into the seafloor 35 million years ago. More notorious is the titan, six miles in diameter, that barreled into the Gulf of Mexico around 65 million years ago, releasing thousands of times more energy than all the nuclear weapons on the planet combined. "The whole Earth burned that day," says Ed Lu, a physicist and former astronaut. Three-quarters of all life-forms, including the dinosaurs, went extinct." Don't Flush - Donate To Space Exploration! By Keith Cowing on July 15, 2008 6:08 PM. "The Orion Program will be holding a urine collection study starting Monday, July 21 and running through Thursday, July 31, 2008. We are looking for donors as we need to collect a large amount of urine per day for the entire 11 day period. Please contact [deleted] at [deleted]@hs.utc.com to express interest in donating or to get answers to any questions you have regarding the study. We will be hosting an informational meeting with encouraged attendance for potential urine donors from 11-11:30 a.m. Thursday, July 17, 2008 in the first floor conference room. In this meeting we will go over instructions and guidelines for the study and introduce volunteers to the equipment that will be used in the study. If you are unable to attend this meeting due to scheduling conflicts, we can set up another time to clarify the study operations on an individual basis." "I can't say for certain what they might be testing, but they certainly must need a lot if they're asking visitors to participate as well." "The need is voluminous: 30 liters a day, which translates into nearly 8 gallons. Even on weekends." "Have a business meeting in Houston next week? Be a good American and drop by for quick pee break at 2200 Space Park near the Johnson Space Center. Yes, you read that right: NASA needs your urine." "Fun With Urine" chronicles how the award-winning teacher uses 'gross' and 'goofy' ideas to interest his students in science and the NASA space program." "NASA needs urine -- lots of it -- and it's tapping the power of crowdsourcing." "Talk about a leaked memo in the mainstream press. NASA was the subject of gleeful global news coverage Wednesday after an internal document asking employees to donate their urine for space toilet research made it from the confines of the Johnson Space Center to the whole planet." By Keith Cowing on July 15, 2008 1:44 PM. "At a Special Luncheon Address at the 37th COSPAR Scientific Assembly in Montreal, Canada, the Chairman of the ASE's Committee on NEOs, Rusty Schweickart, advised the international gathering of scientists that their political colleagues would soon be turning to them for advice on asteroid impacts. The ASE NEO Committee and its international Panel on Asteroid Threat Mitigation will be soon complete and submit its report and recommendations to the United Nations regarding protecting the Earth from future asteroid impacts." By Keith Cowing on July 15, 2008 12:23 AM. "Employees at NASAs Jet Propulsion Laboratory got an ultimatum last year: Submit to new, more thorough background investigations or leave the agency. Twenty-eight JPL scientists, engineers and administrative support employees instead took their employers to court. The plaintiffs and some observers say the ensuing legal battle has raised questions about the federal governments background investigation methods and the constitutionality of the trigger event: Homeland Security Presidential Directive 12. The process also exposed the agencys laundry list of workforce problems, union officials say." By Keith Cowing on July 14, 2008 5:43 PM. "The Jupiter design is being reviewed by a team of 57 volunteer engineers, from line engineers up to NASA middle managers, Tierney said. Those numbers are dwarfed by NASA's Ares work force, which has thousands of government workers and contractors. The head of the Ares office at Marshall said he can't rule out the possibility that some of his people are involved with the underground program. "I don't know what people do on their own time," Steve Cook said in a recent interview with The Associated Press." "Editor's note: When I asked Steve Cook if any of his employees were working on the "Direct" or "Jupiter" project he said that he was not aware of that anyone was. When asked if this would be allowed during or after hours, he said that it would not and that this would be "unapproved" work." By Keith Cowing on July 14, 2008 12:25 PM. "The Governor will join NASA and federal and state fire officials at the NASA Ames Research Center at Moffett Field to tour the facility and discuss the important role of NASA's remotely piloted aircraft to California's firefight. Watch the live webcast at 10:45 a.m. PDT"
"A remotely piloted aircraft carrying a NASA sensor flew over much of California earlier this week, gathering information that will be used to help fight more than 300 wildfires burning within the state. Additional flights are planned for next week." By Keith Cowing on July 14, 2008 12:12 PM. 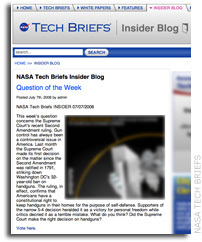 Editor's 12 July note: The "about" link on NASA Tech Briefs website says "NASA Tech Briefs is... An official publication of NASA." "This week's question concerns the Supreme Court's recent Second Amendment ruling. Gun control has always been a controversial issue in America." [Click on image on right to enlarge] Regardless of where you stand on this issue, shouldn't this "official publication of NASA" be focusing on NASA, aerospace, etc.? Then again, there is a shotgun aboard every Soyuz docked at the ISS - but they are Russian. Is NASA developing better space-qualified shotguns for Orion? NOTE: this is NOT an invitation to post pro- or con opinions on gun control. Don't bother because they will not be posted. If you want to weigh in as to whether this non-aerospace topic should be openly discussed by "an official NASA publication", feel free to comment. Editor's update: But wait - there's more. It would seem that the NASA Tech Briefs Question of the Week for several months (see examples below) has had absolutely nothing to do with NASA. You'd think that such "an official publication of NASA" would be trying to raise issues relevant to the agency among its readership - both to inform the readers of what NASA is doing - and educate the agency as to what the private sector is interested in. Guess again. Have a look below. Help NASA TechBriefs out. What questions would YOU be asking of the private sector, industrial, and policy people who read this magazine and its website? 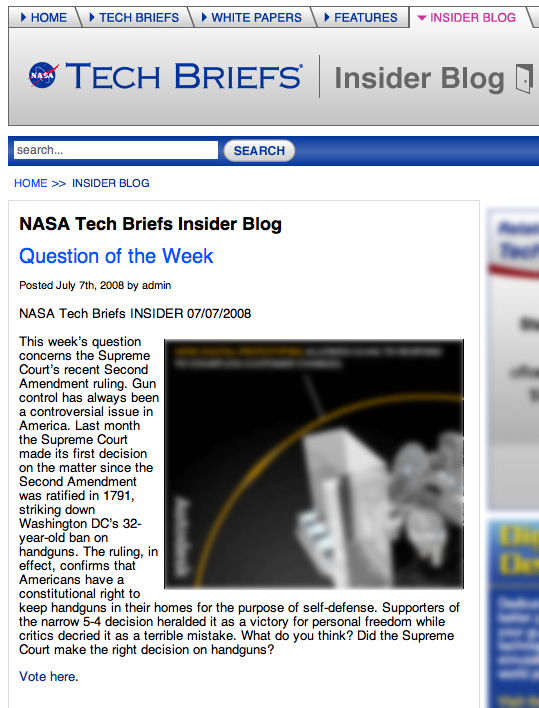 Editor's 14 July note: If you check the comments section you will see that Joe Pramberger, President of Associated Business Publications International, tries to make the point that newsletter material published on a website with the explicit statement "NASA Tech Briefs is... An official publication of NASA" is somehow "NOT an official NASA publication" is confusing to say the least. He seems to want to have it both ways. FYI I have an archive of that page - which has now been removed. There was no disclaimer to that effect other than the generic one that applies to all material on the website. Continue reading Official NASA Publication Seeks Opinions On Gun Control. By Keith Cowing on July 13, 2008 4:31 PM. Editor's note: This CCTV video segment shows preparations for the upcoming Shenzhou VII scheduled for launch in October 2008. Continue reading Today's Video: Shenzhou VII Preparations. By Keith Cowing on July 13, 2008 11:34 AM. Editor's note: According to this Republican National Committee website "Welcome to the most grassroots-driven platform development effort in the history of American politics! The Republican Party is seeking your input as we develop the policies and principles upon which we should stand for the next four years. On this website, you can share your thoughts, participate in polls, and communicate directly with the policymakers who will be shaping the party's agenda. All comments and feedback will be reviewed and taken into full consideration as we prepare for our convention in Minneapolis-St. Paul." So, sign up for an an account, login, and start telling them what you think about space. Let's see if the DNC offers a similar service - we'll certainly link to it if they do. Editor's update: Looks like the Democratic National Committee has something very similar online: "Today the Democratic National Committee and Obama for America unveiled a bold new initiative to involve the American people in the development of the Democratic National Platform. This year, for the first time, voters will have the opportunity to take part in Platform Meetings in all 50 states to help shape the Democratic Platform." By Keith Cowing on July 12, 2008 8:26 PM. "I have an alternative proposal: Send the ISS somewhere. The ISS, you see, is already an interplanetary spacecraft -- at least potentially. It's missing a drive system and a steerage module, but those are technicalities. Although it's ungainly in appearance, it's designed to be boosted periodically to a higher altitude by a shuttle, a Russian Soyuz or one of the upcoming new Constellation program Orion spacecraft. It could fairly easily be retrofitted for operations beyond low-Earth orbit. In principle, we could fly it almost anywhere within the inner solar system -- to any place where it could still receive enough solar power to keep all its systems running." Editor's note: Where do I start - the author is clearly confused as to how the ISS is constructed and what it does and does not have (it does have a "drive system and a steerage module"). As for his proposed mission scenarios, if only this man had a clue as to how much mass is involved, the energies required, and what the propulsive capabilities are of the things he wants to use to push the ISS around the inner solar system. As currently designed, Orion can barely get itself to the ISS! According to the Post "Michael Benson, the author of "Beyond: Visions of the Interplanetary Probes," writes frequently on space science issues.". Well it sure is not evident from this article. By Keith Cowing on July 12, 2008 12:08 PM. "This week: En route to Washington Reagan National Airport, Rep. Gabrielle Giffords (D-Ariz.) talks about being married to astronaut Mark Kelly, her prospects of becoming the first female president and an image from Afghanistan that she cant get out of her head." Who Should Get A Space Shuttle? By Keith Cowing on July 11, 2008 11:28 AM. "Pursuant to the National Environmental Policy Act of 1969 (NEPA), as amended (42 U.S.C. 4321 et seq. ), the Council on Environmental Quality (CEQ) Regulations for Implementing the Procedural Provisions of NEPA (40 CFR parts 1500-1508), and NASA policy and procedures (14 CFR Part 1216, Subpart 1216.3), NASA has made a Finding of No Significant Impact (FONSI) with respect to the disposition of the Space Shuttle Program's (SSP's) real and personal property using a structured process consisting of a coordinated series of actions. Under Presidential direction, NASA will cease operations of its SSP by 2010." Editor's note: There are three space shuttles in need of a permanent home. Where should they go? Thoughts? By Keith Cowing on July 10, 2008 3:59 PM. "International Space Station Commander Sergei Volkov and Flight Engineer Oleg Kononenko began a spacewalk at 2:48 p.m. EDT Thursday to inspect and retrieve an explosive bolt from their Soyuz TMA-12. The bolt will be returned to Earth for examination. The spacewalk comes in the wake of two consecutive ballistic entries by the previous Soyuz spacecraft, entries that resulted in high-G rides for the crews and landings hundreds of miles short of the planned recovery area. Russian engineers say they have evidence that failed explosive bolts that help separate two modules likely are responsible." By Keith Cowing on July 10, 2008 1:38 PM. Editor's note: Contractor layoffs across Goddard and at IV&V are apparently in the works. Bryan O'Connor is headed out to IV&V tomorrow for an all hands meeting. While at IV&V O'Connor will be leading a Board of Directors (IBD) meeting. Word has it that an internal memo from NASA HQ describes actions to be taken with regard to IV&V. This memo includes the output of a recent PA&E investigation. IV&V is located in the home district of Rep. Alan Mollohan, D-WV. Mollohan is Chairman of the Subcommittee on Commerce, Justice, Science, and Related Agencies of the House Appropriations Committee. By Keith Cowing on July 10, 2008 1:05 PM. "Scientists running the High Resolution Imaging Science Experiment, known as HiRISE, on NASA's Mars Reconnaissance Orbiter have processed more details in an amazing image their camera captured as the Phoenix spacecraft descended through Mars' atmosphere during its landing on May 25, 2008. New analysis has turned up what likely is Phoenix's heat shield falling toward Mars' surface, they conclude. HiRISE, run from The University of Arizona, made history by taking the first image of a spacecraft as it descended toward the surface of another planetary body." Editor's note: Oh, I am not sure about that. As a NASA Watch reader pointed out, there are images, such as this one of the Apollo 11 Eagle as it descended to the lunar surface .... and then, of course there were the Ranger probes who televised their own descent to the lunar surface. By Keith Cowing on July 9, 2008 5:56 PM. "The House of Representatives today passed bills commemorating the 50th Anniversary of the National Aeronautics and Space Administration (NASA), and honoring the first American woman to go into space. Committee Member, Rep. Michael McCaul (R-TX), offered H.Res. 1315, commemorating the 50th anniversary of NASA, which was established on July 29, 1958. Specifically, the resolution honors the dedicated workforce at NASA, acknowledges the value of NASA's many discoveries and accomplishments, and pledges to maintain America's position as the world leader in aeronautics and space exploration and technology." By Keith Cowing on July 9, 2008 2:00 PM. "Over the last 6 months, representatives from the National Aeronautics and Space Administration (NASA) and the European Space Agency (ESA) have been engaged in detailed assessment of potential programs and technologies that when conducted cooperatively could one day support a human outpost on the Moon. NASA and ESA experts jointly briefed the results of the NASA/ESA Comparative Architecture Assessment on 7 and 8 July during an ESA sponsored Integrated Architecture Review held at ESA's ESTEC facility in Noordwijk, The Netherlands." By Keith Cowing on July 9, 2008 12:54 PM. "On Tuesday morning, weather permitting, the painter will lead a team of five artists as they fly 23,000 feet into the air to create art inspired by the feeling of total weightlessness. Heavily influenced by the Norwegian artist Edvard Munch Azam's work is primarily concerned with how bodies can be represented in different states of motion and tension." Editor's note: I certainly hope this guy paints fast - with ony 20 seconds or so of weightlessness per parabola, he'll need to be very efficient with his time. He'll also have to stow his paint and brushes in that time before they start to pull 2 Gs. Could get messy. By Keith Cowing on July 9, 2008 10:12 AM. "Uncertainty over the fate of President Bush's ambitious "vision" of a manned moon-Mars mission, announced with great fanfare in 2004, is emblematic. The program was approved by Congress, but the administration's refusal to significantly increase spending to build a new generation of spacecraft has slowed development while leading to angry complaints that NASA is cannibalizing promising unmanned science missions to pay for the moon-Mars effort. NASA's Griffin has told worried members of Congress that additional funds could move up the delivery date of the new-generation spacecraft from 2015 to 2013. The White House has rejected Senate efforts to provide the money." By Keith Cowing on July 8, 2008 12:23 PM. "Challenger Center for Space Science Education is pleased to announce that Teacher in Space Christa McAuliffe's original lessons are now available for teachers on Challenger Center's website." "The Boeing Company this week sent more than 90 teachers from around the world to the 17th Annual Boeing Educators to SPACE CAMP(R) program at the U.S. Space & Rocket Center in Huntsville, Ala."
"Sixty-one students from 14 colleges and universities around the globe have imagined what the next generation of airliners and cargo planes may look like." By Keith Cowing on July 8, 2008 12:11 PM. "NASA is in crisis--overburdened, under-funded and inefficient. Yet the progressive legacy of space, which dates back to JFK, is being quietly reborn: NASA can reinvent itself as a critical resource in climate change mitigation; the UN and some in the U.S. military are collaborating to prevent space weapons from becoming an arms race with China; and progressive "NewSpace" entrepreneurs are creating new domestic high-tech jobs. Before 2009, a new progressive space policy needs to be devised and advocated beyond the traditional space constituencies, to upgrade Bush's failing space exploration vision. Who better to initiate this work than the Netroots?" By Keith Cowing on July 8, 2008 11:04 AM. ... Now if only Exploration Systems could get their responses to the technical questions people are asking from buried in their Exploration Systems->About->FAQ page to their front page so people don't have to go to NASAWatch to find a copy, that would really be a giant leap forward." By Keith Cowing on July 7, 2008 6:08 PM. "Following a detailed, integrated assessment, NASA selected target launch dates for the remaining eight space shuttle missions on the current manifest in 2009 and 2010. The manifest includes one flight to the Hubble Space Telescope, seven assembly flights to the International Space Station, and two station contingency flights, planned to be completed before the end of fiscal year 2010. The agency previously selected Oct. 8 and Nov. 10 as launch dates for Atlantis' STS-125 mission to service Hubble and Endeavour's STS-126 / ULF-2 mission to supply the space station and service both Solar Alpha Rotary Joints on the port and starboard end of its truss backbone that supports equipment and solar arrays." By Keith Cowing on July 7, 2008 10:02 AM. By Keith Cowing on July 7, 2008 9:15 AM. "Mr. Schweickart said progress so far had come through constant pushing against resistant bureaucracies and politicians focused on whatever is the issue of the moment. And he said there was still no significant effort to devise an international agreement, let alone a deflection technique, for dealing with the inevitable earthbound asteroid or comet, large or small, when it is identified. "It may be subtle," he said, "but failure of the international decision process is the most likely reason that we'll take a hit in the future." By Keith Cowing on July 7, 2008 9:14 AM. "By the end of the year, the world's greatest telescope should be able to see deeper into space and further back in time than ever. If all goes as planned, it will be able to detect events closer to the big bang, explore the "cosmic web" of galaxies and intergalactic gas that make up the large-scale structure of the universe, and reveal much more about how and when distant stars and planets were formed.... It is hard to overstate the importance of the Hubble and its insights into the evolution of the universe, the presence of mysterious dark matter and dark energy, and the existence of hundreds (and probably many more) of planets orbiting distant stars." By Marc Boucher on July 3, 2008 2:04 PM. "Volcanism has played a more extensive role in shaping the surface of Mercury than scientists had thought. This result comes from multispectral imaging data gathered in January 2008 by MESSENGER, the latest spacecraft to visit the Sun's innermost planet. MESSENGER data has also identified and mapped surface rock units that correspond to lava flows, volcanos, and other geological features. At the same time, the spacecraft's suite of instruments has confirmed an apparent planet-wide iron deficiency in Mercury's surface rocks." By Keith Cowing on July 3, 2008 10:51 AM. "Over the last two years, NASA has performed feasibility assessments of the different DIRECT launch vehicle designs that have emerged. "These feasibility assessments are summarized in the attached white paper. The charts below detail the assessments of the DIRECT 2.0 concept (April - May 2007) and the updated DIRECT 2.0 (September 2007) and provide the background for the white paper." Take home message: the DIRECT fan boys should stick to their day jobs and leave bad rocket design to the professionals at NASA. By Keith Cowing on July 3, 2008 10:17 AM. Editor's note: I will be speaking on a panel from 2:15 - 3:15 pm EDT today at the NASA exhibit "Exploration Stage" at the Smithsonian Folklife Festival in downtown Washington, DC. Why Should Anyone Care About Space Politics? By Keith Cowing on July 3, 2008 12:03 AM. "Did you know that NASA is a fascist organization? How about the Constellation program--did you realize that it was fascist too? Or the Apollo program? What about the philosophical/spiritual observation that Arthur C. Clarke defined as "the Overview Effect" whereby from space, Earth's political borders and squabbles disappear? Did you realize that this philosophy--perhaps even Arthur C. Clarke himself--is fascist?" Editor's note: I can't find a thing in this article that I disagree with. The inmates are indeed trying to seize control of the asylum via the blogosphere and Dwayne Day has caught them red handed. Continue reading Why Should Anyone Care About Space Politics?. By Keith Cowing on July 2, 2008 11:42 PM. South, south basin the 15m and 30m contours." Editor's note: Curiously, there is no mention of this ongoing, multi-disciplinary, multi-center activity on ARC, Astrobiology, JSC or ESMD Websites. The only place with a link is Spaceward Bound. By Keith Cowing on July 2, 2008 9:44 PM. "I've been LOS for the last few days. LOS means loss of signal and in the lingo of Mission Control that means that you cannot talk with the astronauts because the radio signal is blocked. My LOS was caused by taking a couple of days off (personal business!! Or rather my wife's honey-do list!) and not having the Blog software set up on my home computer . . . Anyway, this is a good day to tackle some of the comments and questions that folks have been posting, so here goes. I'll start with the easy ones first and work up to the harder ones." By Keith Cowing on July 2, 2008 9:33 PM. "Here is the place where you can find questions and answers to all of your future of space exploration questions from the younger generations of NASA scientists, engineers, and explorers at the 2008 Lunar Science Conference at NASA Ames Research Center." Go to LunarSciConference08, YouTube for additional information. Continue reading Video: Instructions on How to Submit Questions for NASA's Lunar Science Conference. By Keith Cowing on July 2, 2008 8:15 PM. "With jam-packed schedules and a video feed to Earth, astronauts enjoy precious little privacy as it is. Soon, doctors might peek into an astronaut's last bastion of solitude, thanks to a portable brain scanner that could one day go into orbit. Mission control could use the device to remotely monitor astronauts for signs of brain injury, depression and even mental fatigue that could compromise their ability to make a critical repair of equipment." By Keith Cowing on July 2, 2008 5:37 PM. "The Web site was created to offer key information about the details and objectives of the Ares I-X test flight. The site features articles, images and videos that outline the objectives of the Ares I-X test flight and explain how these objectives will influence the design and flight of the Ares I rocket and Orion crew capsule. The Ares I-X flight will test hardware, facilities and ground operations associated with the Ares I rocket. It also will provide critical data during ascent of the integrated Orion crew exploration vehicle and the Ares I launch vehicle stack -- data that will be used to design a vehicle system that is safe and fully operational before astronauts begin traveling into orbit." Penn & Teller: Bullsh*t on NASA: Aptly Named? By Keith Cowing on July 2, 2008 5:14 PM. Editor's note: A few months ago I got an inquiry from the producers of Penn & Tell's Showtime series "Bullsh*t" asking if I would be interested in being interviewed or offer assistance on a show about NASA. I declined. At the time, they said "We're going to basically say that NASA has been in decline since the Apollo missions, some of the current plans (moon base!) are bogus, and worst of all the culture of NASA created a safety situation that ended in the horrible deaths of the Challenger and Columbia astronauts." The underlying intent of this show is obvious in its title. Their producer's email made it crystal clear. They are just looking for filler to edit and parse so as to illustrate their forgone conclusion. On some topics, I find myself in complete agreement with their lampooning. But given that their going-in premise with regard to NASA is negative, they are certain to find what they are looking for. Here is an innocuous preview clip. Continue reading Penn & Teller: Bullsh*t on NASA: Aptly Named?. By Keith Cowing on July 2, 2008 4:48 PM. 11. Space. The study of earth from space can yield important information about climate change; focus on the cosmos can advance our understanding of the universe; and manned space travel can help us inspire new generations of youth to go into science. Can we afford all of them? How would you prioritize space in your administration?" By Keith Cowing on July 2, 2008 4:39 PM. Editor's note: NASA's Innovative Partnerships Program (IPP) Director Doug Comstock is now Twittering. By Keith Cowing on July 2, 2008 2:30 PM. "MOFFETT FIELD, Calif. -- NASA is considering the development of a university-based, student-led satellite development initiative to begin passing the space exploration torch to a new generation. The American Student Moon Orbiter, or ASMO, concept invites students, faculty and industry leaders in the U.S. with experience in university-based, student-led spaceflight projects to respond to a Request for Information which is planned for release this month and will remain open for at least 90 days. The orbiter will be a small satellite that could orbit the moon and carry scientific instruments designed and developed by students. It is aligned with NASA's lunar exploration agenda." By Keith Cowing on July 2, 2008 9:18 AM. "In nine articles, AW&ST explores topics that need attention on Day 1, such as education, R&D, export controls and NASA funding, as well as looming pressures to trim defense, despite engagement in Iraq and Afghanistan. The issue examines the role that Florida will play in the election, and discusses the impact the candidates' position on the future of the space program will have on the economy of the state's "space coast." By Keith Cowing on July 2, 2008 8:12 AM. 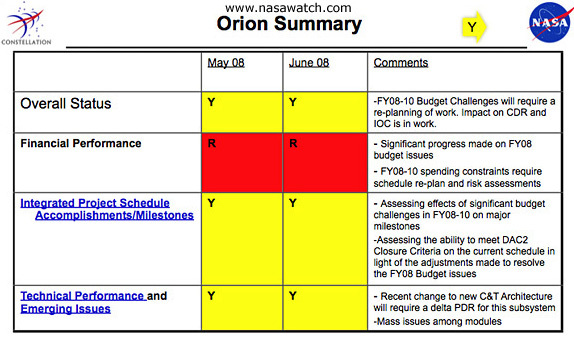 Doug Cooke: "The "direct" variation fails to meet NASA's needs on several grounds. It is vastly over-capacity and too costly to service the International Space Station, but worse, its lift capacity would not be enough for NASA to maintain a sustained presence on the moon. Advocates for the "direct" variation are touting unrealistic development costs and schedules. A fundamental difference is that the Ares I and Orion probability of crew survival is at least two times better than all of the other concepts evaluated, including "direct"-like concepts." Editor's note: Perhaps Doug Cooke will release the results of the actual internal studies NASA personnel performed whereby such a formal evaluation of the Direct Concept was made. NASA did actually evaluate the concept, yes? Or is Doug Cooke just tossing out opinions based on first impressions? Steve Cook claims that no one at NASA has been working on this concept. Yet Doug Cooke says that people at NASA have been looking at it in some detail. They can't both be right, can they? Stay tuned. No doubt there will be some extreme NASA word parsing ahead should NASA ESMD deign to respond. Editor's 2 July 2008 update: It has been a week. No feedback on the FOIA request from NASA. Continue reading Doug Cooke Dumps on Direct Concept. By Keith Cowing on July 1, 2008 6:32 PM. Editor's note:Just got back from 3 days hiking at Dolly Sods. No Internet - on purpose. Catching up right now. By Marc Boucher on July 1, 2008 5:19 PM. NASA will host a media teleconference Thursday, July 3, at 2 p.m. EDT, to discuss analysis of data from the Mercury Surface, Space Environment, Geochemistry and Ranging (MESSENGER) spacecraft's flyby of Mercury earlier this year. The spacecraft is the first designed to orbit the planet closest to the sun. It flew past Mercury on Jan. 14, 2008, and made the first up-close measurements since Mariner 10's final flyby in 1975. By Marc Boucher on July 1, 2008 4:45 PM. NASA will hold a media briefing Wednesday, July 30, at 1 p.m. CDT, with the next resident crew of the International Space Station and an American spaceflight participant. By Marc Boucher on July 1, 2008 12:04 PM. "Ambitious plans for European missions to the Moon and Mars are being considered by the French government. It wants to kick-start a revolution in space by letting EU politicians not bureaucrats decide on priorities for the European Space Agency (ESA). The French say that if Europe fails to change its approach to space, it will fall behind Japan, China and India." By Marc Boucher on July 1, 2008 11:44 AM. "He said his message to the next president is this: "Retain the vision for space exploration. If we turn our backs on the vision again, we're going to have to live in a secondary position in human space flight for the rest of the century."